Wordsworth's magnum opus is generally considered to be The Prelude, a semiautobiographical poem of his early years that he revised and expanded a number of times. It was posthumously titled and published, before which it was generally known as "the poem to Coleridge". Wordsworth was Britain's Poet Laureate from 1843 until his death in 1850. In November 1791 Wordsworth visited Revolutionary France and became enthralled with the Republican movement. He fell in love with a French woman, Annette Vallon, who in 1792 gave birth to their child, Caroline. Because of lack of money and Britain's tensions with France he returned alone to England the next year. The circumstances of his return and his subsequent behaviour raised doubts as to his declared wish to marry Annette, but he supported her and his daughter as best he could in later life. The Reign of Terror estranged him from Republican France, and war between France and Britain prevented him from seeing Annette and Caroline again for several years. With the Peace of Amiens again allowing travel to France, in 1802 Wordsworth and his sister Dorothy visited Annette and Caroline in Calais. The purpose of the visit was to prepare Annette for the fact of his forthcoming marriage to Mary Hutchinson. Afterwards he wrote the sonnet "It is a beauteous evening, calm and free," recalling a seaside walk with the nine-year-old Caroline, whom he had never seen before that visit. Mary was anxious that Wordsworth should do more for Caroline and upon Caroline's marriage, in 1816, when Wordsworth settled 30 pounds a year on her (equivalent to 1,360 pounds as of the year 2000). The payments continued until 1835, when they were replaced by a capital settlement. It was also in 1795 that he met Samuel Taylor Coleridge in Somerset. The two poets quickly developed a close friendship. In 1797 Wordsworth and his sister Dorothy moved to Alfoxton House, Somerset, just a few miles away from Coleridge's home in Nether Stowey. Together Wordsworth and Coleridge (with insights from Dorothy) produced Lyrical Ballads (1798), an important work in the English Romantic movement. The volume gave neither Wordsworth's nor Coleridge's name as author. One of Wordsworth's most famous poems, "Tintern Abbey", was published in this collection, along with Coleridge's "The Rime of the Ancient Mariner". The second edition, published in 1800, had only Wordsworth listed as the author, and included a preface to the poems. It was augmented significantly in the next edition, published in 1802. In this preface, which some scholars consider a central work of Romantic literary theory, Wordsworth discusses what he sees as the elements of a new type of verse, one that is based on the "real language of men" and avoids the poetic diction of much 18th-century verse. Wordsworth also gives his famous definition of poetry as "the spontaneous overflow of powerful feelings: it takes its origin from emotion recollected in tranquility," and calls his own poems in the book "experimental". A fourth and final edition of Lyrical Ballads was published in 1805. Between 1795 and 1797 Wordsworth wrote his only play, The Borderers, a verse tragedy set during the reign of King Henry III of England, when Englishmen in the North Country came into conflict with Scottish rovers. He attempted to get the play staged in November 1797, but it was rejected by Thomas Harris, the manager of the Covent Garden Theatre, who proclaimed it "impossible that the play should succeed in the representation". The rebuff was not received lightly by Wordsworth and the play was not published until 1842, after substantial revision. Wordsworth, Dorothy and Coleridge travelled to Germany in the autumn of 1798. 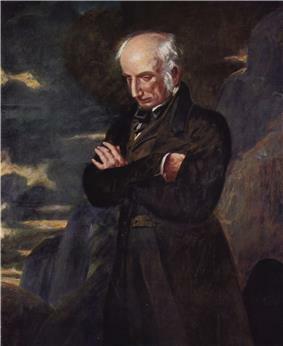 While Coleridge was intellectually stimulated by the journey, its main effect on Wordsworth was to produce homesickness. During the harsh winter of 1798–99 Wordsworth lived with Dorothy in Goslar, and, despite extreme stress and loneliness, began work on the autobiographical piece that was later titled The Prelude. He wrote a number of other famous poems in Goslar, including "The Lucy poems". He and his sister moved back to England, to settle at Dove Cottage in Grasmere in the Lake District, this time with another poet, Robert Southey nearby. Wordsworth, Coleridge and Southey came to be known as the "Lake Poets". Throughout this period many of Wordsworth's poems revolve around themes of death, endurance, separation and grief. 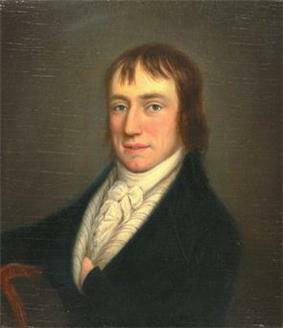 William "Willy" Wordsworth (12 May 1810 – 1883). Married Fanny Graham and had four children: Mary Louisa, William, Reginald, Gordon. Wordsworth's philosophical allegiances as articulated in The Prelude and in such shorter works as "Lines written a few miles above Tintern Abbey" have been a source of critical debate. It was long supposed that Wordsworth relied chiefly on Coleridge for philosophical guidance, but more recently scholars have suggested that Wordsworth's ideas may have been formed years before he and Coleridge became friends in the mid-1790s. In particular, while he was in revolutionary Paris in 1792 the 22-year-old Wordsworth made the acquaintance of the mysterious traveller John "Walking" Stewart (1747–1822), who was nearing the end of his thirty years of wandering, on foot, from Madras, India, through Persia and Arabia, across Africa and Europe, and up through the fledgling United States. By the time of their association Stewart had published an ambitious work of original materialist philosophy entitled The Apocalypse of Nature (London, 1791), to which many of Wordsworth's philosophical sentiments may well be indebted. In 1810 Wordsworth and Coleridge were estranged over the latter's opium addiction, and in 1812 two of Wordsworth's children, Thomas and Catherine, died young. The following year he received an appointment as Distributor of Stamps for Westmorland, and the stipend of 400 pounds a year made him financially secure. In 1813 he and his family, including Dorothy, moved to Rydal Mount, Ambleside (between Grasmere and Rydal Water), where he spent the rest of his life. Some modern critics suggest that there was a decline in his work, beginning around the mid-1810s, perhaps because most of the concerns that characterised his early poems (loss, death, endurance, separation and abandonment) has been resolved in his writings and his life. By 1820 he was enjoying considerable success accompanying a reversal in the contemporary critical opinion of his earlier works. Following the death of his friend the painter William Green in 1823, Wordsworth also mended his relations with Coleridge. The two were fully reconciled by 1828, when they toured the Rhineland together. Dorothy suffered from a severe illness in 1829 that rendered her an invalid for the remainder of her life. 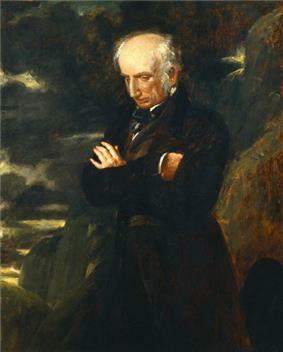 Wordsworth remained a formidable presence in his later years. In 1837 the Scottish poet and playwright Joanna Baillie reflected on her long acquaintance with Wordsworth. "He looks like a man that one must not speak to unless one has some sensible thing to say. however he does occasionally converse cheerfully & well; and when one knows how benevolent & excellent he is, it disposes one to be very much pleased with him." In 1838 Wordsworth received an honorary doctorate in Civil Law from the University of Durham and in 1839 he was awarded the same honorary degree by the University of Oxford. In 1842 the government awarded him a Civil List pension of 300 pounds a year. Following the death of Robert Southey in 1843 Wordsworth became Poet Laureate. He initially refused the honour, saying that he was too old, but accepted when the Prime Minister, Robert Peel, assured him that "you shall have nothing required of you". He became the only laureate to write no official verses. When his daughter Dora died in 1847 his production of verse came to a standstill. William Wordsworth died from an aggravated case of pleurisy on 23 April 1850, and was buried at St Oswald's Church, Grasmere. His widow Mary published his lengthy autobiographical "poem to Coleridge" as The Prelude several months after his death. Though it failed to arouse much interest at that time, it has since come to be widely recognised as his masterpiece. ^ Appendix A (Past Governors) of Allport, D. H. & Friskney, N. J. "A Short History of Wilson's School", Wilson's School Charitable Trust, 1986. ^ "The Cornell Wordsworth Collection". Cornell University. Retrieved on 13 February 2009. ^ Stephen Gill, William Wordsworth: A Life, Oxford University Press, 1989, p. 132-3. ^ Baillie, Joanna (2010). Thomas McLean, ed. Further Letters of Joanna Baillie. Madison, NJ: Fairleigh Dickinson Univ Press. p. 181.